The Swansea canal was 16 miles in length, from Swansea Docks to Abercraf. All along its length there were distance markers at ¼ mile intervals. 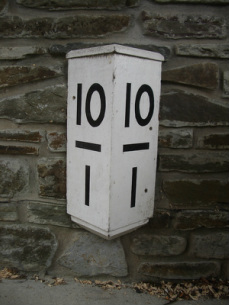 The full distance in miles from Swansea Docks was shown at the top of the post, below the line were ¼ mile markers, 1 mark for ¼ mile, 2 for ½ mile and 3 for ¾ mile. This replica post would have stood at 10¼ miles from Swansea, north of Pontardawe.